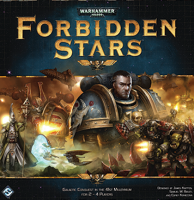 Forbidden Stars challenges you and up to three other players to take command of a mighty fighting force: the Ultramarines chapter of Space Marines, the Eldar of Craftworld Iyanden, the Evil Sunz Ork clan, or the World Eaters Warband of the Chaos Space Marines. Each faction offers unique armies and play styles, but your goal remains the same – to claim the key objectives selected for your faction. These objective tokens are scattered throughout the Herakon Cluster, but your opponents are sure to defend your objectives against you. You’ll need to build massive armies and command them in unending war to best your enemies and claim your objectives. The fight for the Herakon Cluster is brutal and bloody, and you will either stride triumphant over the bodies of your fallen foes, or they will do the same to you. As the general of your faction’s forces in the Herakon Cluster, you have been entrusted with commanding your armies and seizing the crucial objectives scattered throughout the sector. To command your forces in the sector, you issue orders at the beginning of each round. There are four possible orders you can assign to your forces in the Herakon Cluster: deploy, strategize, dominate, and advance. Each order offers a different role for your armies within the systems of this sector. Your battles cause a constant attrition on your forces, and deploy orders allows you to conscript new units for your armies and build new structures. The strategize order invites you to gain new cards to tip the flow of combat or increase the power of your orders. Dominating a system allows you to harvest unique assets from your planets and trigger your faction’s special ability. Finally, the advance order sends your ships flying through the void and your armies marching onto the field of battle. Even as you deliver your orders to your forces, you must be constantly vigilant against your opponent’s plans. During the game, players take turns issuing orders by secretly placing order tokens, but you can freely place order tokens on top of any other order tokens, forming a stack of order tokens assigned to each system. The position of your orders in the stack determines when you can resolve these orders, making every placement a crucial concern. If you can outwit your opponents as you plan your orders, you’ll be in a much better position to outmaneuver their armies once your orders are resolved. Order tokens and issuing orders will be explained in greater depth in future previews. Your orders give you the actions to field your armies and command them across the sector, but the planets of the Herakon Cluster truly lie at the heart of any strategy to lay claim to the sector. These planets host the objective tokens you need to achieve victory, provide materiel to build your armies, and grant you various assets to aid your conquering efforts. Combat is frequent and inevitable in every game of Forbidden Stars and every attack offers a new opportunity for glorious victory and valour. Combat in Forbidden Stars is fast and brutal as battalions of warriors make landfall on planets and massive cruisers and frigates do battle in the void. Every battle is resolved through a combination of cards and dice, which provide different combat icons. While a battle rages, you and your opponent roll dice and choose cunning battlefield tactics by selecting new Combat cards. 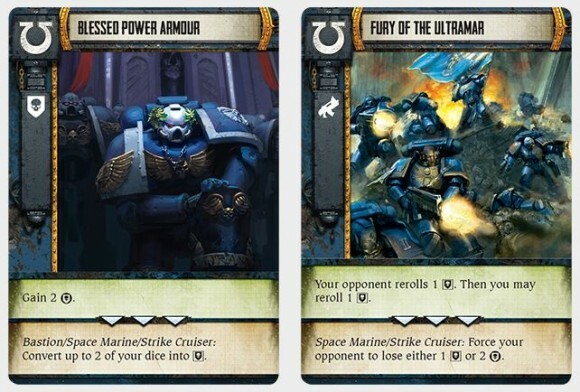 For example, the Blessed Power Armor Combat card has the potential to massively increase your defenses, while Fury of the Ultramar boosts your combat prowess and allows you to breach your opponent’s position. We’ll explore combat and battles in much greater detail in a future preview. Even as you adapt your tactics within a battle using your Combat cards, you’ll need to evaluate your exact goals for each battle. You can focus on destroying as many of your opponent’s units as possible, or you can attempt to fortify your position and weather the storm until combat ends. A wise general knows when to pull his forces back and when to push the attack in hopes of causing maximum enemy casualties. The game ends as soon as one player claims objective tokens equal to the number of players, no matter the cost. You may decide that entire planets and their garrisons must be sacrificed to successfully claim your objectives. Each faction in Forbidden Stars features units and Combat cards unique to that race, meaning that each faction brings its own flavour to your battles for the Herakon Cluster. Whether you mow down your opponents with the World Eaters, build your defenses with the Ultramarines, rely on strength of numbers with the Bad Sunz, or outwit your opponent with the Eldar of Craftworld Iyanden, every faction has its own distinctive way to lay claim to the sector. We’ll also delve deeper into each faction’s cards, units, and strategies in future previews! The wars of Forbidden Stars play out against the backdrop of the Herakon Cluster, a recently discovered sector of space – previously inaccessible because of its unpredictable Warp Storms. Although the chaotic influence of the Warp is still powerful in the Herakon Cluster, newly established routes have allowed you and your armies safe entry to the sector. In every game, the board is constructed out of twelve double-sided system tiles. 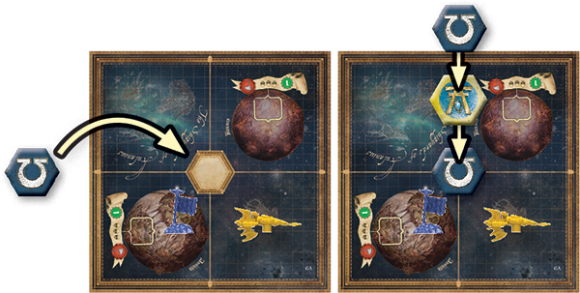 Each system tile is further divided into planets and void spaces, and by choosing and combining these tiles during setup, you can ensure that every game of Forbidden Stars features a completely new configuration of systems and objectives. Choosing which systems connect and where your forces are initially deployed also gives you the chance to start planning your strategy before the game even begins. Even later, once your armies begin to travel between planets, the unpredictable Warp Storms of this sector can greatly influence your armies’ movement. A Warp Storm on the board is placed on an edge between two systems, and while it remains there, it keeps any ships or ground troops from passing through. You and your opponents take turns moving the sector’s Warp Storms at the end of each round, allowing you to potentially close off your opponent’s attack path or split his forces in two. Alternatively, cleverly moving a Warp Storm can open a new attack route for yourself, or defend your flank against an enemy counterattack. The Herakon Cluster is rich with bounty. Ancient archaeotech, planets of untapped potential, and new converts to your cause all lie within this unexplored region of space. You have passed the Warp Storm barrier, but you are not alone. To claim the key objectives that litter this area of space, you must marshal your greatest warriors and set forth into the void. Will you survive and be hailed as a conquering hero? Or will your only epitaph be on a list of those who lost everything in the Herakon Cluster? Forbidden Stars is Fantasy Flight Games’ latest title set in the grim Warhammer 40K universe. In this grand strategic wargame, which plays in about 2-3 hours, two to four players take on different factions like the Ultramarines- enhanced humans who fight for their corpse emperor; Orks, brutal space pillagers; the Eldar, a species with advanced technology and psychic abilities; and the Chaos Space Marines, evil humans corrupted by the warp. 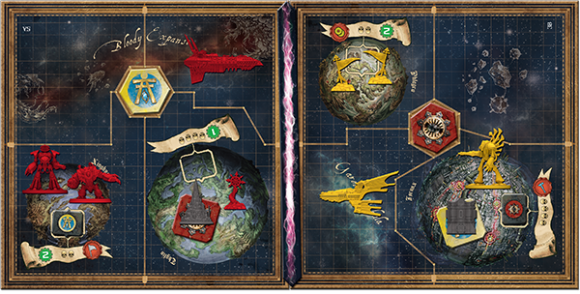 Each faction has its own faction cards, combat deck, event deck, and upgrade deck, as well as mountains of plastic spaceships and land forces. The board itself is made up of tiles “systems”, depending upon the number of players. Each system contains worlds and voids- spaces for land forces and spaceships. Scattered throughout the systems are each factions objective tokens, forcing conflict as players attempt to gain their tokens. The game plays out in a series of up to eight rounds, each round containing three phases. The first phase is planning. 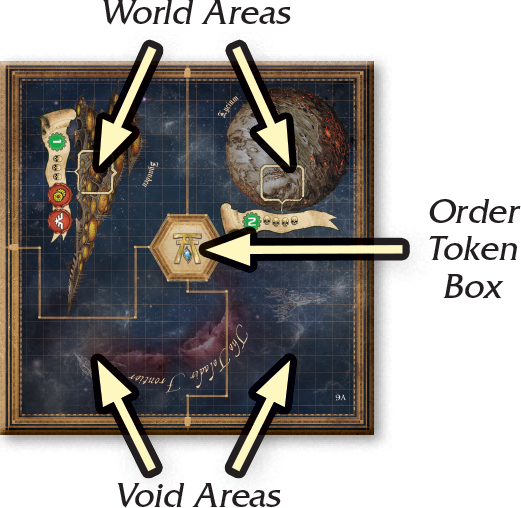 Players each place four command tokens on systems where they have units or adjacent systems. During the next phase, player take turns resolving the tokens they have placed. Since tokens are stacked in each system, players must plan carefully. Only the topmost token in a system can be activated, and if a player has no tokens on top of a system he must wait until one is next before he can resolve it. The command tokens allow players to deploy, essentially allowing them to build units and structures (factories, cities, and citadels); the dominate token allows players to exploit the resources of their worlds and gain special tokens that can help in building and combat; the strategy token allows players to upgrade their combat decks or gain upgrade cards, giving them special advantages; and the advance token can be used to move units from one system to another, or move units within systems. In order to move players must have a chain of land units and spaceships from point of departure to point of arrival. When one or more units enter a world or void where an opponents units exist, combat ensues. Both players total up the amount of dice they roll based on their units. The dice can roll a gun symbol, your attack power; a shield symbol, your defense value; and wings, your morale. After drawing five cards from your combat deck, each player then selects one card to play- first the attacker plays and resolves, then the defender. Assuming one side isn’t wiped out, combat goes three rounds. At the end of three rounds, if neither side is completely eliminated, morale is used to decide the battle. Other factors can be included in combat as well, such as reinforcement tokens. The game lasts until one player has captured objective tokens equal to the number of players, at which point he or she wins the game. Alternatively, if no one has fulfilled this condition, the game ends after eight rounds and whoever has the most objective tokens wins. The are a few more rules here like warp storm movement and event cards, but that is the gist of it. Forbidden Stars is a game that Warhammer 40K has been calling for. It is an Axis & Allies-type strategic adventure game that is deeply thematic and offers more than just dice-chucking battle after dice-chucking battle. Each faction plays very differently, with their units and abilities, and makes for some fun asymmetrical encounters. What is really great about this game is that it doesn’t allow players to turtle. If you want to win, you have to attack. Players who just sit there building up units will definitely lose. In that sense the game is deeply thematic as well as fun and engaging. The Warhammer universe is all about war, and the game really reflects that. Combat is fun and engaging, as players must constantly make choices about their cards and how best to mitigate their dice rolls. Also really fun is the way in which players can customize their decks, building them up for later advantage. It’s a fun deck building aspect that really adds a lot to the game and a mechanic that one would not expect from this big box wargame. The game, of course, is a beautiful production for start to finish. The artwork, the cards, the tokens, the minis, the board- it’s all first rate. Once again Fantasy Flight Games has demonstrated why they are a leader in board game design and execution. This game follows in the footsteps of other great Fantasy Flight Games productions like Twilight Imperium, Battlestar Galactica, Star Wars: Armada, and Star Wars: Imperial Assault. Top notch components all the way. My only significant complaint with the game has to do with combat. Combat, while fun for players engaged in it, can take a while(from a 3-4mins to 8-10mins depending on analysis paralysis) In 3-4 player games this means a bit of sitting around. A lot of games have downtime, but this is a game that keeps all players fairly engaged throughout- except when other players are in combat. This is too bad, and perhaps this is something that the inevitable expansions will address down the line. Still, this is a relatively minor complaint compared with everything that this game gets right. All told, Fantasy Flight Games’ Forbidden Stars is another fantastic board game that will keep you and your friends riveted throughout. It’s just a lot of fun! I saw Dicetower folks gush over this game with preview copies and frankly I wasn’t impressed. My game group consists of my family of three boys, (10/15/17) and my wife. We aren’t into the Warhammer universe (although one of our first games we bought was Bloodbowl team manager) and the video of the play through just didn’t sell it to us. Yet, there it was sitting on the shelf of my German local game store when I went in to buy some paints for my Memoir ’44 figures and €90 was way out of my pocket cash for the day. But there it WAS! These folks never have new American games… Oh what the heck. I’m sure the 15yo will play it with me. His strategy developmentfor board games is starting to surpass mine and his ability to grasp mechanics and view “the whole board” is rather innate it seems. So, (ehem) reluctantly I bought it and hid it in my trunk until my wife left and pulled it out to show spawn-2. We immediately gushed at the big box and miniatures and big box and also the miniatures. He gave me the task to read the rules and have it on the table for an after dinner go. I was happy to oblige this rather above himself request. Honestly, rules are quite simple and easy enough for a new-ish gamer to understand and grock. After learning Star Wars: Imperial Assault I really like the way FFG handles rule books. Give me a quick learn and an alpha/cross references rules guide and I’ll know exactly where to go (even if there are a few discrepancies between the play book and the reference guide)! Anyway, with the rules soundly under my fingers we set out to play our first game and were immediately immersed for the next 2.5 hours in this game! The theme had us, the strategies had us, the simplicity of the game had us and the big box and the minis had us too! Our second game of two player came in at just under 2 hours and we made it through 5 of the 8 levels before 15yo picked up his second token and won. Today we added 10yo and don’t judge by the time, but we played 3 rounds in about 3 hours, but that was because we had to help spawn-3 a bit more… But, he actually got the rules enough to make some really good decisions. 17yo and I played the other day… But he isn’t much into strategy past Memoir. High Asymetric Strategy – although the factions are well balanced even if you don’t utilize their special abilities, if one of your players knows how to best use their team and you don’t, you will lose! Theme and gameplay kept us riveted – I’m usually done and bored with Mice and Mystics by the second hour. 15yo picked up way too fast his faction abilities and differences and was laying waste to us before we could figure out what to do. 10yo had a hard time thinking ahead when laying Order tokens (stacking Orders makes you think a few movements ahead. If you want assets before you build your units, you better first Order the build and THEN Order your Dominate. Most of the smaller minis came out of the box well bent. A little hot water fixed ’em right up, but as they are flags, the poles are quite thin and I’ve actually had to ‘hot water’ them a few times. Replay is very high for Middle son and I. Hopefully I can get a few one on one games in with 10yo to keep him interested. Older son is on his own. Gameplay is solid fun for us! NEVER thought we’d like this type of game. Price is a bit high, but you get a lot of really cool bits! OH!!!! And THANK goodness Fantasy Flight did NOT include those stupid mini-cards! I hate them!! Hate’em! But that’s just me. This is a game with dark stars and I give it no stars. I do no think it is a game I want to play. I looked at in in a store and it looked big. There were other Flight of Fantasy games there and they all were big. Why so many big games and all big games! I do not need so many things even if they look nice. I like Warhammer to read but every time in a game it is so complicated. I like to read about Drizzt and I like to read about Warhammer in space and in fantasy because everyone is Drizzt. Haha! I will keep reading the books and say no to this too big game. Add a Review for "Forbidden Stars"